2019 Registration will open at 8:00 a.m. on January 9, 2019. The Camp Card is an award-winning fundraising program that helps Scouts earn their way to camp or other outdoor adventures! The Alamo Area Council Camp Cards offer discounts at several area businesses. Each Camp Card is sold for $5.00, with 50% going to the unit and 50% going to the Council. Units are encouraged to use these funds to ensure that every Scout can attend summer camp. 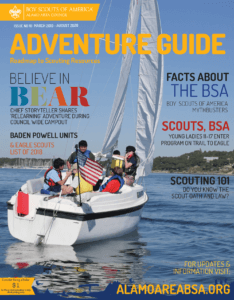 The Council’s portion covers the cost of production, securing sponsors, promotional materials, and supports camping and other operations for Scouting year-round. The annual sale is held during the spring; the 2019 sale will run from March 1 to May 10. Units can participate in the Camp Card program RISK FREE – unsold cards may be returned to the Council by Friday, May 10, 2019 without penalty. Units DO NOT need to prepay for their first round of Camp Cards. However, the first round/set of cards must be paid in full ($2.50 each) before additional rounds/sets of cards are received by the unit. Remember, your Unit keeps 50% commission. Payment may be made by check, credit card, or cash (Check and Cards are preferred). Temporary checks CAN NOT be accepted. Camp Cards will only be issued and returned at the Council Service Center, at 2226 NW Military Hwy. For more information, please contact Campcards@AlamoAreaBSA.org. Friday, May 10, 2018, 3:30 PM – Payment and ALL UNSOLD CARDS due at Council Service Center. LATE FEE DATE: Monday, May 13 – A LATE FEE OF 25 CENTS PER CARD will be applied to all unpaid/non-returned cards. No exceptions! Every card remaining in unit inventory will require payment to Council of $2.75 per card ($2.50 original cost + $.25 late fee). Payments and Camp Card Returns WILL ONLY be accepted at the Main Council Office.